The VHGMC has many downloads available which are great bonus to being a paid club member. These include dozens of downloadable back issues of ‘The Cultivator‘ club magazine going all the way back to 1993 – a great way to see photos of machines and events as well as read what the club has been doing for horticultural collectors over the last three decades. This is the A4 size VHGMC editable & printable log sheet that can be used on your exhibits at shows. It can be used by members & non-paid members. 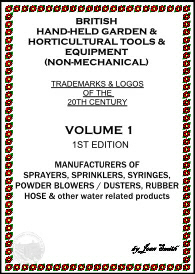 Trademarks and Logos: 58 pages: Sprayers, Sprinklers, Syringes, Powder Blowers/Dusters, Rubber Hose & other water related products. This is a section devoted to Ransomes downloads, containing ploughs, tool frames and other equipment documents.